When I fell for a nice young man a few years back, I also fell in love with his neighborhood – Park Slope, Brooklyn. I found a fabulous and reasonably priced charming pre-war brownstone with a single and somewhat inevitable flaw for these types of buildings: a long, narrow, dizzyingly endless hallway. 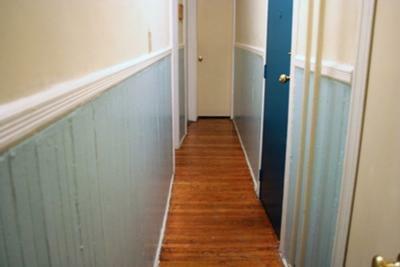 The hallway was all off-white, from the molding to the baseboard to the ceiling. Walking through it felt like a scene from Willy Wonka! We decided that painting the baseboard and main door, leaving the upper half of the walls and the door frames neutral, would help break up the Great Wall of Brooklyn. We chose a teal for the door simply because we loved the color. Our landlord purchased the paint and paid a workman for the labor, so I do not have the details about that paint variety. We then needed a paint color for the baseboard that was calming, gender-neutral to appease future tenants, complimented the door, and provided significant contrast against the off-white walls and white door frames. We settled on a shade called Rhythmic Blue by Behr. The original paint on the walls was semi-gloss. We asked the paint salesmen what they recommended for our project. We learned that if we were re-painting a neutral semi-gloss, it would be okay to paint over it with a darker semi-gloss without primer. Just to be safe, we purchased a self-priming paint called Premium Plus Semi-Gloss. The paint salesmen were correct! We taped off the molding and laid a drop cloth on the floor. Using a large roller, a small roller and a medium brush, we applied a single coat and allowed to dry overnight before removing the painter’s tape. Success! The hallway is no longer a panic attack waiting to happen! We also purchased a metal “2” for our front door, and painted it to match the baseboard. It’s very charming! Love the colors, especially the teal for the door. Very alive and yet, calm and simple at the same time :) The colors you used gave me an idea on what to use for my room. Thanks for sharing! !